”MORE EUROPE” to obywatelska inicjatywa kulturalna, której celem jest podkreślenie i wzmocnienie roli kultury w relacjach zewnętrznych UE. Obecna edycja debaty ”More Europe“ odbywa się w stolicy największego kraju spośród tak zwanych „nowych członków“ UE. Polska, aktywnie współpracując w dziedzinie kultury z krajami spoza Unii, zwłaszcza z państwami Partnerstwa Wschodniego, pełni rolę „mostu“ pomiędzy Zachodem a Wschodem, także w obszarze polityki i gospodarki, kładąc jednocześnie szczególny nacisk na wzmocnienie społeczeństwa obywatelskiego przez kulturę. Debata dotyczyć będzie głównie sposobu, w jaki kultura może wspierać budowę europejskiej tożsamości kulturowej w oparciu o społeczeństwo obywatelskie wewnątrz i na zewnątrz UE; struktur do tego potrzebnych; a także sposobu, w jaki artyści i artystki oraz organizacje pozarządowe spoza UE, widzą te kwestie. “MORE EUROPE” is a civic cultural initiative that seeks to highlight and reinforce the role of culture in the external relations of the European Union. This edition of More Europe takes place in the capital of Poland, the biggest country among the so called “new” EU Member States and a very active player in the field of cultural co-operation with countries outside the European Union, notably the Eastern Partnership area. Poland acts as a “bridge” between the West and the East in terms of politics, the economy and culture, and puts special emphasis on strengthening civil societies through culture. The Warsaw debate will focus on ways in which culture can contribute to the development of a European cultural identity through the activities of civil societies inside and outside the EU. It will also look at the structures needed to support this process, and present insights of artists and NGOs from outside the EU. On the occasion of the European Football Championship “EURO 2012”, organized in Poland and Ukraine from 8th June until 1st July, the Press Office participated in several events. The events, that took place at “Galleria Freta” in the historical center of Warsaw, were organized by the musician of Greek origin Milo Kurtis and under the auspices of the Greek Embassy in Warsaw. They included concerts, exhibitions of paintings, sculptures and photographs, films, classes of Greek dances, a theater performance, a debate on Greece`s current affairs, gastronomy etc. Several musicians, such as Milo Kurtis and “Naxos Quintet”, Kostas Georgiadis and the group “Edesea”, Apostolis Anthimos, Jorgos Skolias and “Sefardic Trio”, Maja Sikorowska, the group ‘Olympus’, several artists, such as the sculptor Christos Mandzios, the painter Michalis Chrisoulidis and the photographer Kostas Kawardzis, the film director Athena Savidis, the journalist Dionysios Sturis, the philosopher and musician Ilias Vrazas, the byzantine choir of the orthodox church of St. Mary Magdalene in Warsaw, were among those who have performed during the cultural week. Representatives of business, academic and artistic sectors of Greeks in Poland, Polish academics, journalists and representatives of Polish authorities, Greek journalists covering the participation of the Greek football team in “Euro 2012”, the General Secretary of Sports, Panos Bitsaxis, were among the participants. A ceremony during which the official city-keys of Legionowo were handed over to the charge d`affaires of the Greek Embassy, Stavros Spyridakis. For the promotion of the European Football Championship in 20 trains, Polish Railways have painted 16 of them in the colours of European countries` flags. On the 19th of May there was a parade of 5 trains painted with the colours of Greek, Polish, Ukrainian, Czech and Russian flags on a central bridge of Warsaw. The Press Office collaborated with representatives of the Polish Railways (PKP) in order to present the Greek flag on a Polish train. The dictionary includes common phrases in major European languages and was issued in cooperation with the UEFA, the EUNIC Cluster Warsaw (EU National Institutes for Culture) and the French Institute in Warsaw. The Press Office translated the leaflet into Greek language. The opening of the exhibition The Memorial: 16 Artists Propose, featuring projects that were submitted last year by 16 artists, as part of an international competition for the construction of a Holocaust Memorial of Greek Jews, took place at the Jewish Museum of Greece. The competition was conducted by the Jewish Community of Athens and resulted in the selection of the work of artist DeAnna Maganias which was unveiled at a special event in May 2010. The museum is also organising a week-long programme of educational activities and memorial events, lasting until February 4. The exhibition –which will remain open until August 2011- is part of events that have been planned for the Holocaust Martyrs’ and Heroes’ Remembrance Day, co-organized by the Attica region and the Jewish community of Athens for January 26 and 27. A memorial service was held on the 27th of January, at the Athens Synagogue in Thisseio, to be followed by a speech by University of Athens History Professor, Hagen Fleischer. Minister of Foreign Affairs Dimitris Droutsas issued a statement on the occasion of the Holocaust Memorial Day, in which he referred to Greece’s continuing efforts to preseve historical memory and educate younger generations. He further added that preparations are underway for a permanent Greek exhibition at the Auschwitz Museum. It seems that ages have gone by since Maria Callas stunned the audience by performing ‘Norma’ at the Epidaurus theatre as part of events celebrating the Greek festival in 1960. 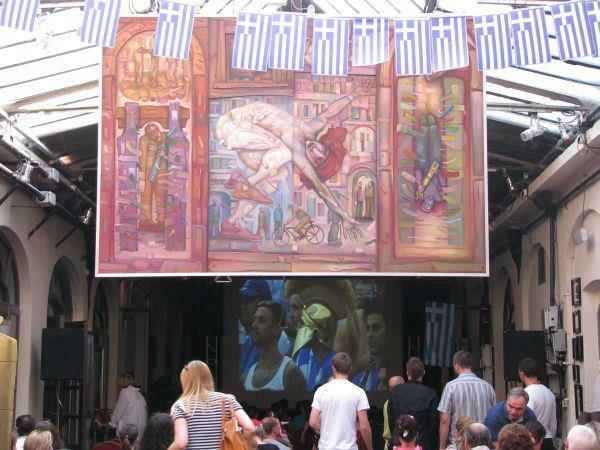 The 2010 Greek Festival, which opens today, encompasses a variety of artistic expressions. Its aim is to present contemporary artists from around the globe and acquaint the world public with both innovative and pervasive trends of modern artistic creations. The festival spans from June to mid –August with old and new venues hosting the events, such as the Herodus Attikus theatre, the Benaki Museum, and the Building H at the Peiraios 260 complex. This year music lovers will have the opportunity to enjoy Rufus Wainwright in a one-man-show on June 5 at the Lycabettus Hill Theatre. In the first half, he will present his newly- released album, while in the second, he will play major hits from his entire career. (GREEK NEWS AGENDA) The Giorgio de Chirico Art Centre is located in the centre of the city of Volos, Greece’s third-largest port city, where the famous Italian painter was born in 1888. The Art Centre, located on a pedestrian road next to the Municipal Conservatory, is housed in a new glass building that has been named after the Surrealist painter who was the founder of the “scuola metafisica” (metaphysical school) art movement. The ground floor, mezzanine and second floors of the Art Centre, which was inaugurated in September 1990, house the Volos Municipal Art Collection. The latter includes more than 400 paintings, sculptures, hagiographies, ceramics, mosaics and artistic photographs, as well as periodical exhibitions, and a small library. The other two floors house the Alexander Damtsas Museum, a permanent exhibition of the Volos-born art aficionado’s collection comprising some 500 paintings and gravures by mostly Greek artists representing all the important art styles from the late 19th century to date. (GREEK NEWS AGENDA) The Hellenic Foundation for Culture (www.hfc.gr) promotes Greek culture and language throughout the world carrying out its activities through its branches in various cities and countries. Forthcoming cultural events in Greece can be accessed at the new www.goculture.gr website along with interviews, critical comments and review articles on the Greek and European cultural scene. The Benaki Museum (www.benaki.gr) ranks among the major cultural institutions in Greece. Its extensive collections (Greece at the Benaki Museum, Greek Artists of the 20th Century, Chinese Art, Pre-Columbian Art, Islamic Art) are now presented via a new state-of-the-art website.